Check out this stunner from Dorothea's Closet on eBay. I love the way the straps attach to the bust. I know the weather is about to change soon (it's been unseasonably warm here in Chicago these last two weeks) as I have had one last gasp of mooning over summer dresses, especially sundresses. This dress might convert me to sundress-person mode — especially the one made up in a border print. I'd love to try this in stripes, too! Or gingham. Or (it goes without saying) polka dots. If you want to get a jump on next summer, you could do worse than buying this pattern. In fact, I think looking at this might be nearly as effective as those lightboxes in treating seasonal affective disorder. I love it – it looks like the sort of sundress you could wear a bra with, for one. Wouldn’t it be lovely made up in that rose/trellis lawn fabric…?But I’m on a pattern-and-fabric reduction plan right now. Seriously.I mean it. I love sun dresses! Fortunately, I live in Florida so the dress code allows them pretty much year round. I’m still hoping to slim down into one I found last summer – yellow with blue flowers and a very tight waist (which I like because I’m a natural hourglass). It’s the only yellow dress I’ve ever found where the color actually looks good on me. That dress looks lovely, but I shudder at the notion of buttoning something under my breasts. Surely the buttons would pop open every other minute, won’t they? In very fine print above the notions notations there is a line that calls for a zipper to be used in the side seam.Lovely dress! how about a little button-on cape to convert this into a non-sundress? Since you are a fabric maven, I have to ask – where do you find border prints? Especially online, I can’t seem to find any good ones and I’m obsessed with border print fabric. 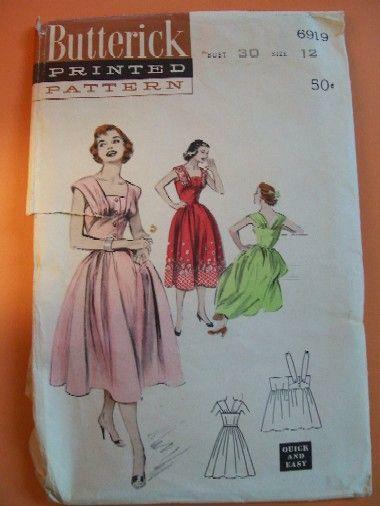 I have so many dress patterns just screaming out for a good border and I just can’t seem to find good ones. Knittinmol, if you are having trouble finding border prints that appeal to you, look under “sari” or “saree;” most saris have a very distinctive field and border, and approximately five yards of fabric for you to work with, and a pallu (endpiece), often a yard long, or coordinated but distinctively different design.For the other ladies, a nice sturdy hook-and-eye, supporting or replacing a button in distress, is a very useful item indeed.